The purpose of this study was to construct a grounded theory that describes the experiences and explains the process of prelicensure baccalaureate nursing students as they progressed in a traditional nursing program. Strauss and Corbin's approach to grounded theory was utilized to guide this study. The basic social psychological process (BSPP) for baccalaureate nursing students that emerged was “searching for balance and utilizing support networks while growing a professional identity.” The core category identified was unanticipated expectations, whereas the subcategories that emerged were self-doubt, confidence, sacrifice, rigor, and relevance. To successfully progress through the program, students needed to relinquish preconceptions and acclimate to the academic and, ultimately, the professional nursing climate. The Institute of Medicine's Future of Nursing report (2010) called for an increase in the number of baccalaureate-prepared nurses from 50% to 80% by the year 2020. Although there has been a reported 3.6% increase in entry-level Bachelor of Science in Nursing (BSN) programs in 2016, the current nursing workforce continues to fall short of these recommendations, with only 55% of the nurses prepared at a baccalaureate level (American Association of Colleges of Nursing, 2017). Academic institutions are attempting to accommodate the Institute of Medicine's recommendation to increase the number of BSN-prepared nurses, yet high attrition of nursing students remains a concern (Harris, Rosenberg, & Grace O'Rourke, 2014; Kukkonen, Suhonen, & Salminen, 2016). Nursing faculty need to identify processes to retain qualified students in their programs so those students will become confident and competent professional nurses. According to the American College Health Association (2017), 57% of traditional college students surveyed (N = 63,497) reported they experienced “above average” or “tremendous” stress; 30.6% indicated that stress affected their academic performance; 87% felt overwhelmed by all they had to do; 84% felt exhausted (not from physical activity); and 39.1% felt so depressed that it was difficult to function. Without intervention, students may use poor coping mechanisms that can ultimately lead to adverse health and educational outcomes. The stress experienced by nursing students is thought to be higher than that experienced by other college students (Shinde & Hiremath, 2014; Shudifat & Al-Husban, 2015; Wolf, Stidham, & Ross, 2015). Nursing students experience higher levels of stress and more physiological and psychological symptoms than students in other health-related disciplines (Kaur et al., 2009; Wolf et al., 2015). In particular, nursing students experience high levels of stress from rigorous academic requirements, high-stakes methods of evaluation, long hours spent in clinical rotations, patient care responsibilities, and their perceived lack of guidance from clinical faculty (Gibbons, Dempster, & Moutray, 2011; Shinde & Hiremath, 2014; Shudifat, & Al-Husban, 2015). It is important to explore and explain the influence of these stressors on students and then to identify interventions to guide and support students through their educational experiences. The purpose of this study was to construct a grounded theory that describes the experiences and explains the process of prelicensure baccalaureate nursing students as they progress in a traditional nursing program. Coping strategies students used to adjust to the demands of their educational experiences and college lives were also explored and described. The methodology used was symbolic interactionism, a theoretical perspective that highlights the relationship between individuals and society, as mediated by symbolic communication (Schreiber & Stern, 2001). Strauss and Corbin's (1990) approach to grounded theory was used to guide the research as it provided the best approach to address the research question. This approach emphasizes the use of multiple data sources to describe the social processes involved. The investigator utilized observation, field notes, and interviews to inform the emerging theory. The study initially used purposive sampling of BSN students attending a small, private, 4-year institution, located in a mostly suburban area within the mid-Atlantic region. It was necessary to analyze a variety of participant stories describing their unique experiences. The study institution's program first enrolled students in nursing courses at the sophomore level, and although first-year college students' experiences are important as well, freshmen were not sampled. Nursing students who were in their sophomore, junior, or senior year were sampled to best inform the emergent theory. Inclusion criteria included students, male or female, 18 to 24 years old, and English speaking. Exclusion criteria were those students not yet a nursing major, under the age of 18 or over the age of 24 years, and unable to speak or comprehend the English language. Effort was made to solicit participants from each of the 3 academic years because a heterogeneous sample population was desired in order to better inform an emergent theory. As the theory developed, purposive, theoretical sampling was used as data were collected, coded, and analyzed. Comparison groups were selected for their theoretical relevance in the development of emerging categories (Glaser & Strauss, 1967). The researcher identified student groups that would generate as many properties of the category as possible. Through constant comparative methods and theoretical sampling, the investigator determined there was no need for a second interview with the initial participants and instead, additional students were purposively recruited to add to the emerging theory. Additional questions were utilized to identify gaps in the current data and guide future interviews. Interviews continued until data were deemed saturated (Strauss & Corbin, 1990). After 2 weeks of classroom observations and 14 student interviews, the investigator determined that theoretical saturation was reached. Data were collected during one spring semester and occurred in two phases. Once permission was received from the institutional review board, initial data were collected in the first phase through observation and field notes. The investigator observed a total of 14 classes, of varying academic levels, in nursing classroom settings. Field notes were written immediately following the observations so details would not be forgotten or missed, and they were then utilized to record the investigator's perceptions of the classroom environment and student–faculty interactions. Observations of student group dynamics, interactions with faculty, and the social environment were noted. The investigator became familiar with routines, patterns, and formal and informal interactions of students in the program. It was the intention of the investigator to blend in with the environment as much as possible, but at times students would speak to the investigator and engage in friendly conversation. These informal conversations were noted in the field notes and referenced at times during the participant interviews. For example, one of the students spoke of the challenges of having “block” or 3-hour-long scheduling for the nursing courses. Following the 2-week observation phase, students were recruited and interviews conducted. Interviews followed a semistructured interview guide and lasted approximately 45 to 60 minutes. Student interviews began with the same open-ended question: “Tell me about your experience as a college student.” Probes and additional open-ended questions were used to explore the methods students used to adjust to the challenges of college life and aid in their success (Table 1). Interviews were audiotaped using a digital recorder and transcribed by a professional transcription service. Institutional review board approvals were obtained from both the investigator's university, as well as the university where the study was conducted. Informed consent was obtained, and participants were assured of their rights of autonomy, confidentiality, and self-determination. Narrative and demographic data were stored in a locked file cabinet, as well as a password-protected computer folder, accessible only to the investigator. Constant comparative analyses were utilized to develop the core category and subcategories of data (Glaser & Strauss, 1967). Comparative analysis began with the observation phase of the study and continued through the last participant interview. The procedure included open coding, axial coding, selective coding, memoing, and diagramming of narrative responses to clarify the emerging social process as recommended by Strauss and Corbin (1990). Major categories began to emerge during the axial coding phase of the analysis with categories becoming more organized. Strauss and Corbin (1990) encouraged the investigator to consider the context in which categories occur; it was in this axial coding phase of data collection and concurrent analyses that a core category, unanticipated expectations, began to emerge. For example, early in the interviewing process, participants began to discuss the difficult transition that occurred when they first began nursing courses. They described that they were prepared for the transition to college but not for the “culture shock” and how difficult the adjustment to the nursing curriculum would be. Diagrams and maps were used from the beginning of the study and modified multiple times throughout data collection process as the investigator explored categories, subcategories, and the relationships between them. The field notes from the initial classroom observations were also incorporated into the diagrams and maps. These field notes were compared with the data obtained during the student interviews. Efforts to understand the process were based on the participants' descriptions of their physical, psychosocial, and spiritual experiences and the investigator's interpretation of these. Visual depictions allowed the investigator to better conceptualize the emergent theory as a basic social psychological process (BSPP). The emergent BSPP appropriately addressed the qualitative methodology of grounded theory. Trustworthiness was maintained through accurate recording of the students' vivid descriptions of experiences in the nursing program. Transcripts were evaluated on a continual basis to ensure that the concepts were generated and grounded in the data. The investigator, with the assistance of dissertation committee members, ensured that there was systematic methodological congruence and procedural rigor. Acknowledgement of personal biases by the investigator was monitored to ensure that it did not influence the data analysis process. Procedural rigor was maintained through the systematic steps in the grounded theory approach to the investigation. Accurate field notes, memorandums, and diagrams were maintained to reflect the analytic process. 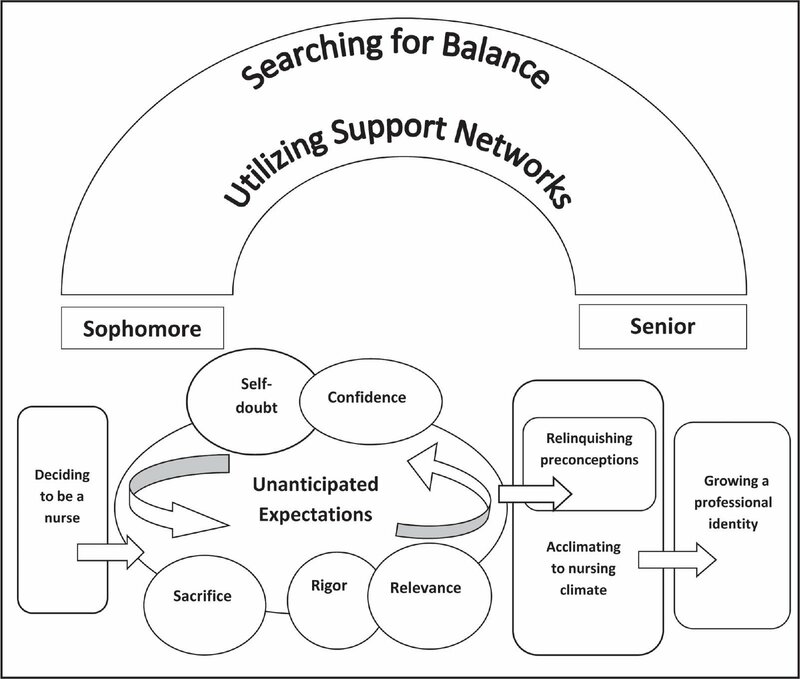 The BSPP of the educational experience of baccalaureate nursing students, as they adjusted to college, was identified as “searching for balance and utilizing support networks while growing their professional identity,” whereas a core category was identified as “unanticipated expectations.” Figure 1 provides a visual depiction of the theory “growing a professional identify.” Figure 1 illustrates the process that began when participants decided to become a nurse and were continually searching for balance and utilizing support networks to eventually develop their professional identity. A visual depiction of the theory growing a professional identity. This diagram illustrates the process that began when participants decided to become nurses and were continually searching for balance and using support networks to eventually develop their professional identity. When students entered the nursing portion of the curriculum, they experienced what was described as the core category, “unanticipated expectations.” This theme emerged when students expressed that the requirements for the nursing program differed from what they anticipated. During this phase of the educational process, they experienced self-doubt, grappled with confidence, and were unaware of how much they would have to sacrifice. At times they became frustrated with the rigor of the program and struggled to find relevance with the overwhelming amount of information they were required to navigate. To complete the process, students found they had to relinquish preconceptions and continue acclimating to the nursing climate as they worked toward growing their professional identity, intertwined with seeking a connection to their professional identity from the start of the program. As soon as they matriculated into nursing courses, participants overwhelmingly described a desire to maintain a healthy balance between sleep, schoolwork, working, and social life; further, they described this as a significant struggle. The ability of the students to find balance and properly identify and use support networks would influence the consequences of the process. Searching for balance became iterative throughout the nursing program. As students continued to progress through the program and as they faced new challenges, they would need to revisit an adequate approach to searching for balance and effectively use support networks. Three subcategories emerged that described the support networks these participants relied on while in the nursing program; these included social support, faculty support, and academic support. Faculty Support. Perceived faculty support, through genuine concern for student success, was important to the participants. Participants appreciated when faculty made themselves available to students. They expressed a desire for faculty to be open to meeting outside of class to review examinations or answer questions. They also appreciated when faculty provided their personal cell phone number. One participant shared, “I called her and she walked me through a bunch of questions. That was huge, and even if you don't actually call her, the fact that she makes herself available like that. It's following up on what you are saying.” They had expectations that faculty would be respectful and treat them in a similar manner to qualities of a professional nurse. Overall, students valued the academic support they received throughout the program. There's so much, and I think it's just knowing that we need to learn so much in so little time, and I think the reality that like, if I was an English major and I wrote a paper and I made an error, that's unfortunate, but my paper's gonna just have to be reedited. However, if I make a mistake in nursing there could be a serious repercussion. Somebody could be really ill because of it, somebody could die because of it, and I think it's realizing the serious—you need to be on your game at all time. It's very stressful, we know this isn't a game you are playing with human lives, and we take that very seriously. The realization that they would have the ability to harm someone emerged in the majority of student interviews. Participant interviews provided information in regard to unanticipated expectations that were experienced in the nursing program. They thought they were inadequately prepared for the expectations of nursing faculty and program requirements. As a result of the action/interaction of nursing students during this phase of the process, five subcategories emerged and influenced the growing of their professional identity. They included self-doubt, confidence, sacrifice, rigor, and relevance. Students voiced that they experienced self-doubt, grappled with confidence, and were unaware of the sacrifices they would be forced to make. They were overwhelmed with the rigor of the program and struggled to find relevance of what they were learning to nursing practice throughout their educational experiences. This phase of the process is iterative and provides the most challenge to nursing students, as they realized that they may or may not continue, or may not wish to continue, in the nursing program. Self-Doubt and Confidence. Two overlapping subcategories emerged during this part of the process as students began to doubt their abilities to succeed in the nursing program. It was common for the participants to question their career choice and their abilities to be effective nurses. A student shared, “No matter what point in the program you are you feel like you don't know enough or aren't smart enough to be doing this.” Most noted that faculty guidance, support, and validation allowed them to gain confidence. As one participant shared, “We have a fragile self-esteem at that point and don't know what we are doing. To have someone say, ‘it's ok, you will get it next time’ or ‘that was good, but maybe you want to try this.’” Participants relied on the validation and support of their instructors to acknowledge that they were knowledgeable and capable of providing care to the patients. Although self-doubt and questioning returned with each new clinical experience, most participants discussed they were more aware of resources to provide support and increase confidence throughout the process. Rigor and Relevance. Two additional overlapping subcategories emerged from the data and revealed that at times participants were immobilized by the rigorous requirements. The rigor of the program repeatedly caused participants to be consumed with self-doubt and led to their need to sacrifice. One participant stated, “Every major feels like they work hard; however, we know nursing is the most difficult. We get to the point that we just know we can never learn 100 chapters at a time.” The new format of testing and volume of material challenged students to learn and adjust to the program. The bad part is in my history class I have to write five papers throughout the year, that I have to do 10 one-page responses for my logic class I am in, and I want to be a philosophy minor so I probably spend more time studying day to day on classes that are not as important to nursing like in the hospital as opposed to pharmacology and my nursing classes. So, I am not learning—I just regurgitate for the test. The result of the action/interaction of the nursing students during their unanticipated expectations influenced how they were able to progress through this phase of the process. The relationship between one's self-doubt and confidence and ability to find relevance amongst the rigor is also influenced by the participant's need to sacrifice when searching for balance and utilizing support networks. To be successful in “growing a professional identity,” participants had to relinquish preconceptions and acclimate to the nursing climate. For this study, relinquishing preconceptions was defined as letting go of expectations, including academic and clinical expectations. Acclimating to the nursing climate meant that students were able to adjust to the realities of the curriculum and profession. Students entered nursing for a variety of reasons; unfortunately, the reality of what they had experienced came with many disappointments. The continual stress, academic workload, and, at times, the manner in which nurses on the units and faculty interacted with students negatively influenced the students' perceptions of the profession. One participant stated, “Some nurses aren't willing to work with students…. They just don't want to be bothered teaching.” Students often left clinical feeling let down, driving them to relinquish their personal views that nurses would enjoy mentoring. One participant stated, “The most frustrating part of clinical wasn't caring for the patient, rather it is always feeling like you are in the nurses' way. Seems they forget they were once students.” They had preconceived opinions about nursing and had not anticipated that the role of the nurse would encompass so many stressful situations. The primary factor that assisted senior-year students in acclimating to the nursing climate was when they participated in a practicum, working one-to-one with a nurse and following their schedule. Several participants thought they learned more during this experience than they had in all the combined clinical rotations. Although this experience also began with self-doubt and questioning, most seniors reported feeling like they were “real nurses” by the end of the rotation. This theory, growing a professional identity, grounded in the narrative descriptions of BSN students, underscores the importance of providing students with supported, positive experiences during their undergraduate studies. Thoughtful consideration of nursing students' expectations for balance and their needs for supportive networks is likely to have a positive influence on student retention. To facilitate a successful transition to college and throughout the nursing curriculum, it is important for students and faculty to explore students' expectations of the nursing program. Most participants in this study voiced that they were initially unprepared to meet curricular expectations, despite that they thought high schools prepared them for college. Faculty must acknowledge that as students transition from adolescence to adulthood, they are at considerable risk as they often have personal, economic, social, and academic stressors. Conversely, students have increased self-confidence when they have social support, are aware of their resources, and have reassurance of the importance and relevance of course and curricular requirements (Wolf et al., 2015). When students are supported and cared for, their self-esteem and confidence are enhanced; further, they will learn to be caring in their own professional lives (Wolf et al., 2015). Future research should focus on testing this substantive theory in different settings and types of nursing programs. It will be beneficial to explore perceptions of accelerated nursing students as they progress at a rapid pace through the nursing curriculum to learn if their process of growing a professional identity is similar. It may also be beneficial to examine the unique stressors of first-year students who may not have been able to officially declare nursing as their major. They will likely need to meet progression standards to matriculate into the nursing program, which may create considerable stress. Further exploration of innovative strategies that address the unanticipated expectations and resultant stressors of nursing students need to be conducted. Descriptions of student experiences with clinical partnerships, mentoring, and simulation learning may provide additional insight into the theory of growing a professional identity. The BSPP of “searching for balance and utilizing support networks while growing a professional identity” has yielded substantive findings that will be beneficial in creating student-centered learning environments. This process must be built on mutual respect, collaborative partnerships, and supportive networks that encourage student retention and the development of a positive professional identity. This study was conducted at one academic institution in the northeast region of the United States, which may limit the application of findings to a broader population. Due to the nature of qualitative research, the findings are contextual and participant dependent, yet they have strong implications for future research on explaining how new nurses develop a positive professional identity. A basic social psychological process emerged from the data as nursing students continued growing their professional identity. Identification of the substantive theory—growing a professional identity—supports previous research findings and has implications for nursing education, practice, science, and future research. The data obtained in this study, from observations and participant interviews, explained the process and identified challenges that students experience while trying to adjust to unanticipated expectations. Glaser, B.G. & Strauss, A.L. (1967). The discovery of grounded theory: Strategies for qualitative research. Chicago, IL: Aldine. Harris, R.C., Rosenberg, L. & Grace O'Rourke, M.E. (2014). Addressing the challenges of nursing student attrition. Journal of Nursing Education, 53, 31–37. Institute of Medicine. (2010). The future of nursing: Leading change, advancing health. Washington, DC: The National Academies Press. Kaur, S., Das, K., Amrinder, N., Kanika, S., Meena, P., Gagandeep, I. & Arash, R. (2009). Stress and coping in nursing students. Journal of Mental Health and Human Behavior, 14, 51–56. Schreiber, R.S. & Stern, P.N. (Eds.). (2001). Using grounded theory in nursing. New York, NY: Springer. Strauss, A. & Corbin, J. (1990). Basics of qualitative research: Grounded theory procedures and techniques (2nd ed.). Newbury Park, CA: Sage. Introduction: I am interested in gaining a better understanding of your experience in college, the challenges that you experience as a nursing student, and what you do to try to rise to these challenges. I want to hear your experience to help nursing faculty to assist students in their own nursing programs. The following questions were used as an outline for discussion purposes. 1. Tell me about your experience as a college student. a. Tell me about the most challenging part of being a college student. What do you do when you are experiencing these challenges? What do you do if you feel overwhelmed by these challenges? What things do your peers or others do to assist you with these challenges? Tell me about your experience as a nursing student. a. Tell me about the most challenging aspects of being a nursing student. Describe how these challenges affect you and your ability to learn in your courses. What are the helpful things you do when you are experiencing these challenges? What do you do if you feel overwhelmed about the nursing program? What encounters as a nursing student have influenced your ability to be successful in the program? a. Describe how you handle these encounters. What are the things that college faculty or staff do to assist you? Is there anything else you would like to say to me or discuss before we end this interview? Dr. Goodolf is Assistant Professor and Director of the RN to BSN and Accelerated BSN Programs, Helen S. Breidegam School of Nursing, Moravian College, Bethlehem, Pennsylvania. The author thanks Dr. Lori Hoffman for her editorial assistance and would like to thank her dissertation committee: Dr. Barbara Patterson, Dr. Mary Baumberger-Henry, and Dr. Lori Simmons. Address correspondence to Dawn M. Goodolf, PhD, RN, Assistant Professor and Director, RN to BSN and Accelerated BSN Programs, Helen S. Breidegam School of Nursing, Moravian College, 1200 Main Street, Bethlehem, PA 18018; e-mail: goodolfd@moravian.edu.